Themis | Learn about Greek Mythology,Greek gods,Greek mythology stories! 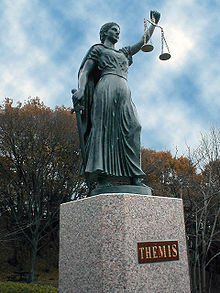 According to Greek mythology,Themis belonged to the Titans, the children of Gaia(earth) and Uranus(sky). She was the anthropomorphic personification of physical and moral order, and etiquette. The word themis(legit) factors from the verb tithimi and states,what has been entered, the current. In practical symbolic level represents the law and its firm order, the divine law. Otherwise Hesiod could not include such a titanic allegorical significance deity in the first gods,daughter of the first divine couple of Uranus and Gaia, Themis then appears as the second companion of Zeus. His marriage with her marked after swallowing his first wife Metis, stabilizing the reign of the strongest of all the gods. A kingdom that time was guaranteed with fixed rules for mortals and gods. Themis in mythology is the one who bestows. The law which she represents is sacred and it applies to gods and is superior even by their wishes. As a goddess she was represented as triune, goddess of natural order, goddess of moral order and prophetess goddess,status which she inherited from her mother Gaia. So according to these,daughters of Themis as representative of the natural order were the Ores(Hours) (= seasons with the typical precision rotation,), as representative of the moral order was Eunomia, the Trial, and Peace, which are the supreme goods of a society, and the three Fates(Mires) (Klotho, Lachesis and Atropos) who personified the destiny of every human and in which their father Zeus commissioned to distribute the goods to the people, and finally as representative of the prophecy were the Nymphs and virgin Astraea also was the personification of justice. Originally Themis having inherited the clairvoyance of her mother replaced her first, at the Oracle of Delphi. But when Apollo was borned she showed to him special love and affection and according to legend she was the first that offered him food,so considered as nurse of Apollo handing him later this oracle. According to Homer's epics,emphasizes that Themis despite Zeus has herald duties and that in his name convene councils of the Olympian gods and supervised the order during the ceremonies of the banquet. Also, she was the one announcing every time the decisions of Zeus hence called "Zeus Themistes" as were called the laws and decisions created by the people in the image of justice of Olympus. With these concepts Hesiod coined in his Theogony,Themis as wife of Zeus, since the idea of ​​order is comorbid status of supreme god. So Themis is presented as protector of law and hospitality and penalize any infringement on them, especially against Paris,who violated the principles, at the Trojan war,which he decided with Zeus. Sometimes Themis was referred as Ihnei goddess, meaning the goddess seeking traces of torts also she was referred as Panderkis goddess,beacuse of the fact that nothing would escape from her attention. At last some mythographers thought Themis as daughter of the Sun in the light of which nothing could be hidden. Indeed,it was said that Themis saw everything ,before people would see it.That was the reason she was considered as an oracle goddess .Aeschylus recognizes Themis as mother of proactive Prometheus. Holy Themis existed in Thessaly, Attica, Boeotia and Olympia.